On my recent holiday to Morocco, I turned to Vichy for my facial sun protection. They’re a french pharmacy brand who are the best of the best when it comes to skincare. If you’re like to look after your skin, want to protect your skin from sun damage and from premature ageing then why not choose a brand that is known for both their high performing skincare and sun protection? 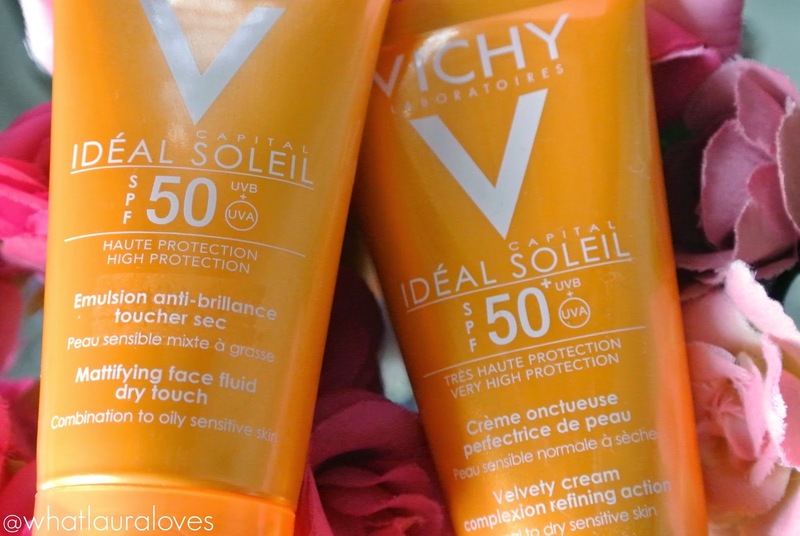 Vichy have introduced their Ideal Soleil range this summer which adds high UV filter protection to a range of suncare products that are designed for all different types of skin. The Ideal Soleil line has different textures to suit different phototypes and skin types which means that you can find an SPF product to suit your skin rather than just picking a one size fits all style approach off a shelf like with standard sun creams. The Ideal Soleil range is formulated with lots of skin loving ingredients such as Hyaluronic Acid, Glycerin and Perlite, to help to hydrate, mattify, moisturise and revive the skin. Wearing an SPF shouldn’t be reserved for hot beach holidays only and this line recognises that with its different formulations of creams, oils and sprays that are suitable for city living and visits, the beach or the ski slops. The Vichy SPF products are available in SPF 30 and SPF 50 and contain a broad spectrum filter system with the inclusion of global anti- UVB and UVA protection Mexoryl XL and SX. They were formulated with the latest advanced research in mind to protect wearers against UVB rays as well as the short and long UVA waves. The latter of which have been found to penetrate the most deeply, making up 75% of all UVA rays that reach the skin and disrupting nearly 1k of the 28k genes that are contained within skin cells. In the short term, they oxidise surface melanin which can lead to the skin looking dull and darkening with a greyish tint and in the long term, the damage started by the oxidative stress causes the dermis and deep epidermis to suffer the full effects of photo-ageing. This can cause dark spots, wrinkles and loss of firmness, making the skin appear older than it is which I’m sure none of you want! 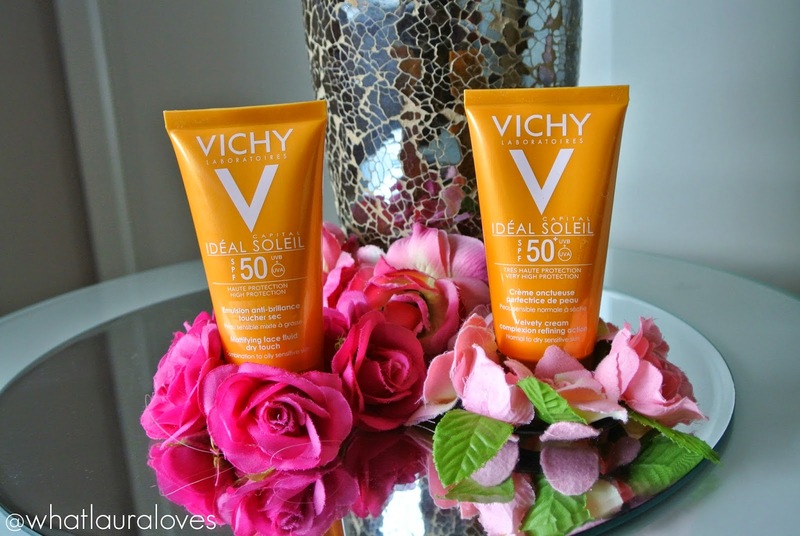 Vichy have designed the Ideal Soleil line with the whole family in mind. It is suitable for even the most sensitive skin and can be used by women, men and children. This is great news for me as when I’m going on holiday with my hubby, we like to share our toiletries and sun protection, rather than taking our own as it just adds to the weight of our cases. While I don’t have children yet, I can imagine there being so much stuff to take away with you on holiday anyway without having to carry extra bottles of sun cream for each family member so the fact that everyone can use the Vichy products is great news. The range consists of a 300ml Face & Body Milk in SPF 30 and 50, a 125ml Body Oil in SPF 20 and 50, a 50ml Velvety BB Cream in SPF 50+, a 50ml Velvety Face Cream in SPF 50, a 50ml Dry Touch Face Cream (Mattifying Face Fluid) in SPF 30 and 50 and a 100ml SOS Balm which is an after sun product. While in Morocco, I was trying out the Mattifying Face Fluid Dry Touch and the Velvety Cream both in SPF 50 which I prefer as I like to use as high a factor as I can, especially on my face. The Mattifying Face Fluid is designed for oily or combination skin which is ideal for me as on a day to day basis, my skin is very oily. This SPF is water resistant so I found that it was an excellent option to use while I was on holiday as I would be in and out of the pool all of the time so my face would often be splashed. It applies very smoothly and mattifies the skin as it absorbs. The skin feels dry to the touch after application, not in a tight or uncomfortable way, just that you don’t feel as though you’ve just applied a cream to your face. It leaves the skin feeling soft and supple without looking shiny. Personally, I’m not bothered about looking shiny when I’m around the pool but for days where we were out and about in Marrakech and going on trips, I really appreciated the zero shine finish. Out of the two face SPFs that I have tried, this would be the one that I will continue using at home in the UK as makeup sits nicely on top of it. The Ideal Soleil Velvety Face Cream was designed with dry skin types in mind but as you all know, I have super oily skin and this cream works incredibly well on my skin so I would say that anyone could use it. Out of the two creams, this is the one that I used the most while I was away and the one that I finished completely (empties post coming soon!). What I loved the most about it is how luxurious it felt on my skin; it was as though I was applying a moisturiser rather than an SPF and my face felt so soft and hydrated after using it. This cream has a silky smooth texture and like the other Vichy face SPF I used, it absorbs quickly into the skin. Both of the creams include the Vichy Thermal Spa Water to help to moisturise and revive the skin which I do think they do. The Velvety Face Cream is also enriched with Hyaluronic Acid which helps to bind moisture to the skin. Out of the two, this one is probably my favourite, at least for using while I’m in a very hot climate as my skin can often feel dry from too much sun but my skin never once felt dry using this cream. It felt soft and hydrated and looked smoother and more supple after use. What I loved about both products is that they don’t leave an oily or sticky residue on the skin after use, even after going in the pool. Plus if I sweat, the product doesn’t seem to run and irritate my eyes like some other face SPFs have in the past. The combination of SPF and skin loving ingredients in the formula of these face SPFs is designed to protect the skin from the damaging effects of the sun and from premature ageing and to improve the skin quality with each use. After using these for the two weeks that I was away, I can definitely say that they achieve what they set out to because not only did they prevent my skin from burning but now that I’m home, my skin looks fantastic. It looks and feels so hydrated, moisturised and plumped up with a sun kissed glow. 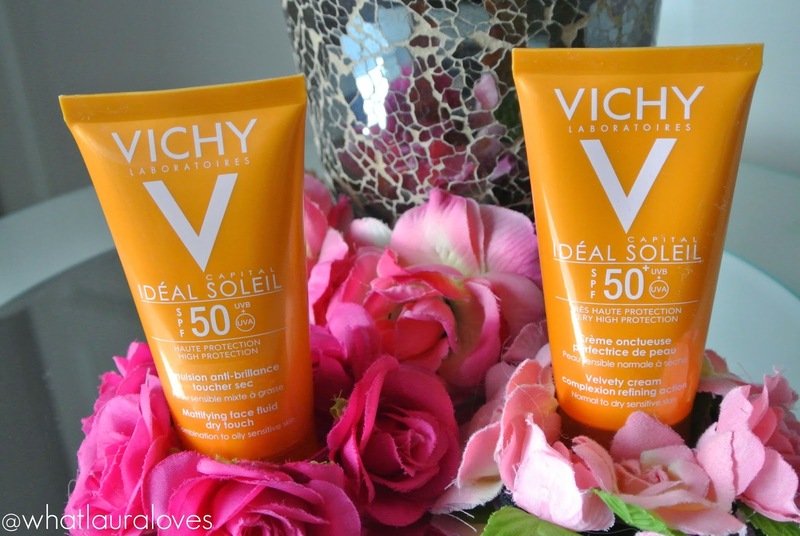 I’d highly recommend the Vichy Ideal Soleil range for your next holiday or for if you’re looking for a daily SPF. 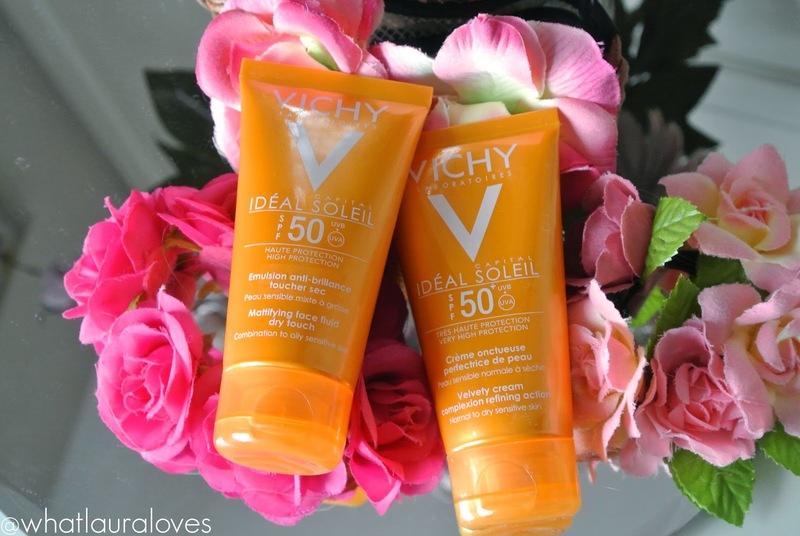 The Vichy Ideal Soleil range is available online here and it is currently on offer! Actually this is very helpful as we are panning for a trip to South Africa. These look like something to try, I need to start actually looking after my face in the sun. I've only heard good things about Vichy and I really want to try it now! I've only heard good things about Vichy! I really want to try it now. I've only heard good things about Vichy. I really want to try it now. I'm still searching for the perfect sunscreen. Haven't tried anything from this brand but it looks great! Great Job! This was a very informative post. I've never been a big believer of sunscreen until recently. Now I don't leave the home without it.